The intention of the HOPPI is to create a player ranking system that based on previous tournament positions. HOPPI produces a score for each player in each tournament between 0 and 100. In order to do this HOPPI calculates a FINISHING VALUE (score for each player in each tournament) that is derived from the POSITION (the position in which a player finished), the VOLUME (the number of participants that competed in that tournament), and DECAY (the time elapsed since the tournament took place). It is also impacted by TYPE (the type of tournament). The HOPPI score is the highest score produced from the above selections. The TYPE of tournament can be classified as either STANDARD or TIERED. A tournament is defined as STANDARD unless the field has been assembled into multiple tiers using past results in which case it is defined as TIERED. Example: The Pyramid League - which has been assembled into multiple tiers from past results - is an example of a TIERED tournament. 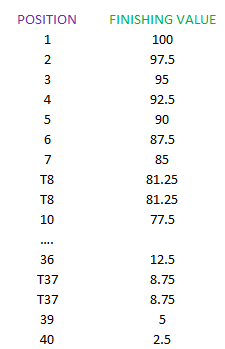 TIERED and STANDARD tournaments differ slightly in calculating FINISHING VALUE (see Sections 7 & 8). Team tournaments and tournaments which restrict entry using criteria such as age or nationality are excluded from HOPPI. Players who do not play any games in a tournament (perhaps due to withdrawal) do not receive a FINISHING VALUE for that tournament. STANDARD tournaments carry a Maximum FINISHING VALUE of 100. DECAY is a value that increase linearly with the number of days. For the purposes of this example, the tournament finishes today and so DECAY is equal to zero (see Section 12). TIERED tournaments carry a Maximum FINISHING VALUE that is dependent on the Tier. The 1st Tier (i.e. the Top Tier) carries a Maximum FINISHING VALUE of 100. All other Tiers carry a Maximum FINISHING VALUE that is equal to the FINISHING VALUE of the MIDPOINT of the Tier above. 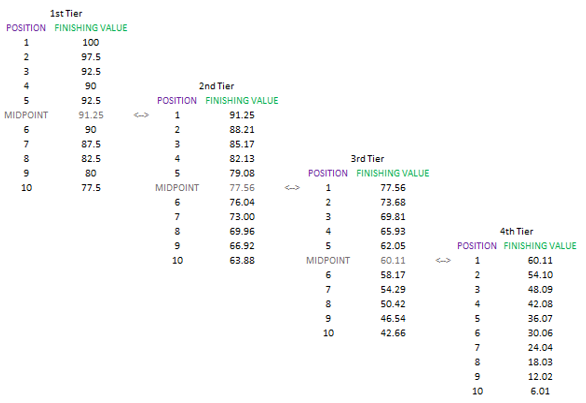 Note that in a TIERED tournament, the difference in FINISHING VALUE between each position is the same within a Tier but widens with each new Tier. It remains calculated by Max FV/VOLUME; the Max FV and VOLUME differs with each tier. HOPPI uses the tournament position that was originally awarded under the specific tournament rules (with some exceptions – see Section 11) to calculate POSITION. An Example of Separating Ties is provided in Section 13. Only played games count towards separating ties. A no-show or adjudicated game (whereby the game did not actually take place) is considered a No-Result and is not counted as either a Win, Loss or Draw. A Bye is also uncounted. Note that Replays and Play-Offs are counted. The original position of kokokitty was T24. kokokitty received two Byes in the tournament and did not win a game. 7 players who did win a game are moved ahead of kokokitty to give a new POSITION of T31. Separating ties criteria are then applied to the tied players. Some Divisions tournaments automatically placed Withdrawn or Disqualified players in last place, even if they scored more points than players who did not withdraw. HOPPI overrules the original position and awards the Withdrawn/Disqualified player a position according to the points they had scored before withdrawing. DEATHHAMMER won 3 games and lost 3 games (scoring 21 points) before leaving the tournament. The original position was 10th. As a score of 21 points in the final table would have been placed in 8th, HOPPI awards DEATHHAMMER a POSITION of 8. Some Divisions tournaments cancelled results of played games in cases where a withdrawn or disqualified player had not completed their games. HOPPI restores the cancelled results and awards the Withdrawn/Disqualified player a position according to the points they had scored before withdrawing. DECAY is a value that increases linearly with the number of days since the tournament ended. HOPPI works on the principle that 2nd today is equal to 1st a year ago. To represent this, a DECAY is applied to all FINISHING VALUES equivalent to 2.5 per year. 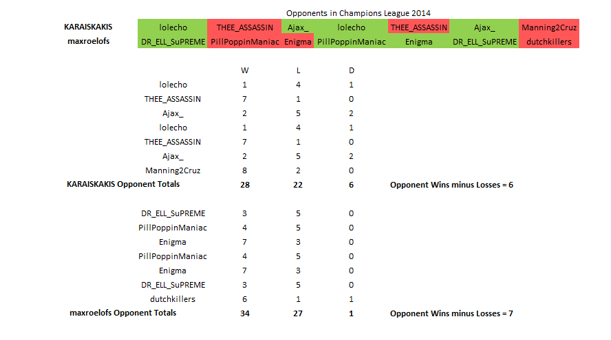 Example: As you can see in the table below The Prof has the same score as KARAISKAKIS and maxroelofs in Criteria A (Wins minus Losses), however as The Prof has Most Wins - Criteria B - he finishes higher. Example: The Wins minus Losses of the opponents of maxroelofs comes to 7 (as you can see in the table below), whereas the Wins minus Losses of the opponents of KARAISKAKIS comes to 6. Maxroelofs therefore finishes above KARAISKAKIS on Criteria E.
josephwhite finishes 16th in WCO 2015/16 – a STANDARD tournament with 46 participants that finished 1,100 days ago. A player has competed in 13 tournaments. A. In previous incarnations of HOPPI players who began competing in tournaments before they had reached their potential suffered – because it was taking a long time before those early scores did not feature in their calculation. The introduction of the Short-Term, Mid-Term and Long-Term HOPPI selection methods change this, as an improving player’s HOPPI score can quickly change. B. In previous incarnations of HOPPI there were an abundance of ties (which mainly occurred in Elimination tournaments). The introduction of the separating ties process (including HOPPIBUCH) has meant that the vast majority of ties have now been eliminated. (For Example, 41 of the 52 ties in WinterTourn 2015/16 were eliminated using the new process). C. In previous incarnations of HOPPI, Divisions tournaments were considered as a whole. By distinguishing tournament TYPE and adjusting the Maximum FINISHING VALUE available, each Division is now considered as its own tournament, meaning that players are now neither under-rewarded for finishing high in a lower division or over-rewarded for finishing low in a higher division. Edited by GaryLShelton, 07 February 2019 - 03:50 PM.